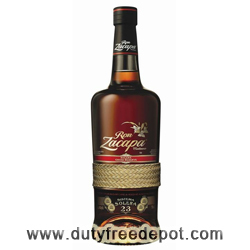 A first-class Guatemalan rum, Ron Zacapa Centenario 23 Y.O. Rum is made from virgin sugar cane honey instead of molasses and aged with the Solera method, like Sherry. The result is a finer, sweeter, smoother rum with very dark, mahogany with coppery tints hue. The nose is a mix of clove, cocoa, cinnamon and orange peel. The palate is sweet and smooth, with cocoa, orange and honey flavors and a sensuous, viscous texture leading to a long and smooth finish. Ron Zacapa Centenario 23 Y.O. Rum won a Gold Medal at the 2007 International Cane Spirits Festival. Make a simple syrup using 1 cup water 1/2 cup sugar and 1/2 cup demerara sugar. Heat stirring and add add 1 cup mint leaves, steep 45 minutes, strain and refrigerate syrup. In shaker add 1oz syrup, 6 mint leaves, juice/peel from 3/4 lime, cracked ice and 2 oz Mt Gay Special Reserve. Shake well to bruise mint. Pour into chilled glass. Add ice then Freixenet to fill. Gently push mixture to stir. Float Ron Zacapa Centenario to taste.